For the archaeological site in the Cusco Region, Peru, see Titiqaqa (Cusco). Lake Titicaca (Spanish: Lago Titicaca, pronounced [ˈlaɣo titiˈkaka]; Quechua: Titiqaqa Qucha) is a large, deep lake in the Andes on the border of Bolivia and Peru, often called the "highest navigable lake" in the world. By volume of water and by surface area, it is the largest lake in South America. Lake Maracaibo has a larger surface area, but it is a tidal bay, not a lake. Lake Titicaca has a surface elevation of 3,812 m (12,507 ft). The "highest navigable lake" claim is generally considered to refer to commercial craft. Numerous smaller bodies of water around the world are at higher elevations. For many years, the largest vessel afloat on the lake was the 2,200-ton (2,425 U.S. tons), 79-metre (259 ft) SS Ollanta. Today, the largest vessel is most likely the similarly sized train barge/float Manco Capac, operated by PeruRail. The lake consists of two nearly separate subbasins connected by the Strait of Tiquina, which is 800 m (2,620 ft) across at the narrowest point. The larger subbasin, Lago Grande (also called Lago Chucuito), has a mean depth of 135 m (443 ft) and a maximum depth of 284 m (932 ft). The smaller subbasin, Wiñaymarka (also called Lago Pequeño, "little lake"), has a mean depth of 9 m (30 ft) and a maximum depth of 40 m (131 ft). The overall average depth of the lake is 107 m (351 ft). Five major river systems feed into Lake Titicaca. In order of their relative flow volumes these are Ramis, Coata, Ilave, Huancané, and Suchez. More than 20 other smaller streams empty into Titicaca. The lake has 41 islands, some of which are densely populated. Having only a single season of free circulation, the lake is monomictic, and water passes through Lago Huiñaimarca and flows out the single outlet at the Río Desaguadero, which then flows south through Bolivia to Lake Poopó. This only accounts for about 10% of the lake's water balance. Evapotranspiration, caused by strong winds and intense sunlight at high altitude, balances the remaining 90% of the water loss. It is nearly a closed lake. Since 2000, Lake Titicaca has experienced constantly receding water levels. Between April and November 2009 alone, the water level dropped by 81 cm (32 in), reaching the lowest level since 1949. This drop is caused by shortened rainy seasons and the melting of glaciers feeding the tributaries of the lake. Water pollution is also an increasing concern because cities in the Titicaca watershed grow, sometimes outpacing solid waste and sewage treatment infrastructure. According to the Global Nature Fund (GNF), Titicaca's biodiversity is threatened by water pollution and the introduction of new species by humans. In 2012, the GNF nominated the lake "Threatened Lake of the Year". The cold sources and winds over the lake give it an average surface temperature of 10 to 14 °C (50 to 57 °F). In the winter (June – September), mixing occurs with the deeper waters, which are always between 10 and 11 °C (50 and 52 °F). Neither the protohistoric nor prehistoric name for Lake Titicaca is known. Given the various Native American groups that occupied the Lake Titicaca region, it likely lacked a single, commonly accepted name in prehistoric times and at the time the Spaniards arrived. The terms titi and caca can be translated in multiple ways. In Aymara, titi can be translated as either puma, lead, or a heavy metal. The word caca (kaka) can be translated as white or gray hairs of the head and the term k’ak’a can be translated as either crack or fissure, or alternatively, comb of a bird. According to Weston La Barre, the Aymara considered in 1948 that the proper name of the lake is titiq’aq’a, which means gray, discolored, lead-colored puma. This phrase refers to the sacred carved rock found on the Island of the Sun. In addition to names including the term titi and/or caca, Lake Titicaca was also known as Chuquivitu in the 16th century. This name can be loosely translated as lance point. This name survives in modern usage in which the large lake is occasionally referred to as Lago Chucuito. 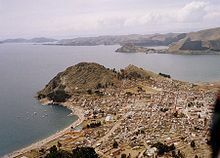 Stanish argues that the logical explanation for the origin of the name Titicaca is a corruption of the term thakhsi cala, which is the 15th- to 16th-century name of the sacred rock on the Island of the Sun. 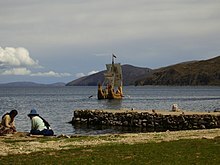 Given the lack of a common name for Lake Titicaca in the 16th century, the Spaniards are thought to have used the name of the site of the most important indigenous shrine in the region, thakhsi cala on the Island of the Sun, as the name for the lake. In time and with usage, this name developed into Titicaca. Locally, the lake goes by several names. The small lake to the south is called Huiñamarca. The large lake also is occasionally referred to as Lago Mayor, and the small lake as Lago Menor. In addition, the southeast quarter of the lake is separate from the main body (connected only by the Strait of Tiquina), and the Bolivians call it Lago Huiñaymarca (also Wiñay Marka, which in Aymara means the Eternal City) and the larger part Lago Chucuito. In Peru, these smaller and larger parts are referred to as Lago Pequeño and Lago Grande, respectively. Two Telmatobius species occur in the lake, the smaller, more coastal marbled water frog (pictured, at Isla del Sol) and the larger, more deep-water Titicaca water frog. Lake Titicaca is home to more than 530 aquatic species. The lake holds large populations of water birds and was designated as a Ramsar Site on August 26, 1998. Several threatened species such as the huge Titicaca water frog and the flightless Titicaca grebe are largely or entirely restricted to the lake, and the Titicaca orestias has likely become extinct (last seen in 1938) due to competition and predation by the introduced rainbow trout and the silverside Odontesthes bonariensis. In addition to the Titicaca orestias, native fish species in the lake's basin are other species of Orestias, and the catfish Trichomycterus dispar, T. rivulatus, and Astroblepus stuebeli (the last species not in the lake itself, but in associated ecosystems). The many Orestias species in Lake Titicaca differ significantly in both habitat preference and feeding behavior. About 90% of the fish species in the basin are endemic, including 23 species of Orestias that only are found in the lake. In addition to the threatened Titicaca grebe, some of the birds associated with water at Titicaca are the white-tufted grebe, Puna ibis, Chilean flamingo, Andean gull, Andean lapwing, white-backed stilt, greater yellowlegs, snowy egret, black-crowned night-heron, Andean coot, common gallinule, plumbeous rail, various ducks, wren-like rushbird, many-colored rush-tyrant, and yellow-winged blackbird. Titicaca is home to 24 described species of freshwater snails (15 endemics, including several tiny Heleobia spp.) and less than half a dozen bivalves (all in family Sphaeriidae), but in general these are very poorly known and their taxonomy is in need of a review. The lake also has an endemic species flock of amphipods consisting of 11 Hyalella (an additional Titicaca Hyalella species is nonendemic). Reeds and other aquatic vegetation is widespread in Lake Titicaca. Totora reeds grow in water shallower than 3 m (9.8 ft), less frequently to 5.5 m (18 ft), but macrophytes, notably Chara and Potamogeton, occur down to 10 m (33 ft). In sheltered shallow waters, such as the harbour of Puno, Azolla, Elodea, Lemna and Myriophyllum are common. The Tinajani Basin, in which Lake Titicaca lies, is an intermontane basin. This basin is a pull-apart basin created by strike-slip movement along regional faults starting in the late Oligocene and ending in the late Miocene. The initial development of the Tinajani Basin is indicated by volcanic rocks, which accumulated between 27 and 20 million years ago within this basin. They lie upon an angular unconformity which cuts across pre-basin strata. Lacustrine sediments of the Lower Tinajani Formation, which are exposed within the Tinajani Basin, demonstrate the presence of a pre-Quaternary, ancestral Lake Titicaca within it between 18 and 14 million years ago (Mya). Little is known about the prehistory of Lake Titicaca between 14 Mya and 370,000 BP because the lake sediments dating to this period lie buried beneath the bottom of Lake Titicaca and have not yet been sampled by continuous coring. The Lake Titicaca drilling project recovered a 136-m-long drill core of sediments from the bottom of Lake Titicaca at a depth of 235 m (771 ft) and at a location just east of Isla del Sol. This core contains a continuous record of lake sedimentation and paleoenvironmental conditions for Lake Titicaca back to about 370,000 BP. For this period of time, Lake Titicaca was typically fresher and had higher lake levels during periods of expanded regional glaciation that corresponded to global glacial periods. During periods of reduced regional glaciation that corresponded to global interglacial periods, Lake Titicaca had typically low lake levels. Lacustrine sediments and associated terraces provide evidence for the past existence of five major prehistoric lakes that occupied the Tinajani Basin during the Pliocene and Pleistocene. Within the northern Altiplano (Tinajani Basin), these prehistoric lakes were Lake Mataro at an elevation of 3,950 m (12,960 ft), Lake Cabana at an elevation of 3,900 m (12,800 ft), Lake Ballivián at an elevation of 3,860 m (12,660 ft), Lake (North) Minchin at an elevation of 3,825 m (12,549 ft), and Lake (North) Tauca at an elevation 3,815 m (12,516 ft). The age of Lake Mataro is uncertain—it may date back to the Late Pliocene. Lake Cabana possibly dates to the Middle Pleistocene. Lake Ballivián existed between 120,000 and 98,000 BP. Two high lake stands, between 72,000–68,000 BP and 44,000–34,000 BP, have been discerned for Lake Minchin within the Altiplano. Another ancient lake in the area is Ouki. The high lake levels of Lake Tauca have been dated as having occurred between 18,100 and 14,100 BP. 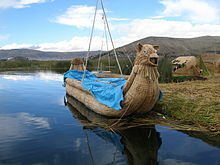 Lake Titicaca has a borderline subtropical highland/alpine climate with cool to cold temperatures for most of the year. The average annual precipitation is 610 mm (24 in) mostly falling in summer thunderstorms. Winters are dry with very cold nights and mornings and warm afternoons. Below are the average temperatures of the town Juliaca in the northern part of the lake. The "Floating Islands" are small, man-made islands constructed by the Uros (or Uru) people from layers of cut totora, a thick, buoyant reed that grows abundantly in the shallows of Lake Titicaca. The Uros harvest the reeds that naturally grow on the lake's banks to make the islands by continuously adding reeds to the surface. According to legend, the Uru people originated in the Amazon and migrated to the area of Lake Titicaca in the pre-Columbian era, where they were oppressed by the local population and were unable to secure land of their own. They built the reed islands, which could be moved into deep water or to different parts of the lake, as necessary, for greater safety from their hostile neighbors on land. Golden in color, many of the islands measure about 15 by 15 m (50 by 50 ft), and the largest are roughly half the size of a football field. Each island contains several thatched houses, typically belonging to members of a single extended family. Some of the islands have watchtowers and other buildings, also constructed of reeds. Historically, most of the Uros islands were located near the middle of the lake, about 14 km (9 mi) from the shore; however, in 1986, after a major storm devastated the islands, many Uros rebuilt closer to shore. As of 2011[update], about 1,200 Uros lived on an archipelago of 60 artificial islands, clustering in the western corner of the lake near Puno, Titicaca's major Peruvian port town. The islands have become one of Peru's tourist attractions, allowing the Uros to supplement their hunting and fishing by conveying visitors to the islands by motorboat and selling handicrafts. Amantani is another small island on Lake Titicaca populated by Quechua speakers. About 4,000 people live in 10 communities on the roughly circular 15 km2 (6 sq mi) island. Two mountain peaks, called Pachatata (Father Earth) and Pachamama (Mother Earth) and ancient ruins are on the top of both peaks. The hillsides that rise up from the lake are terraced and planted with wheat, potatoes, and vegetables. Most of the small fields are worked by hand. Long stone fences divide the fields, and cattle and sheep graze on the hillsides. No cars and no hotels are on the island. Since machines are not allowed on the island, all agriculture is done by hand. A few small stores sell basic goods, and a health clinic and six schools are found. Electricity was produced by a generator and provided limited power a few hours each day, but with the rising price of the petroleum, they no longer use the generator. Most families use candles or flashlights powered by batteries or hand cranks. Small solar panels have recently been installed on some homes. Some of the families on Amantani open their homes to tourists for overnight stays and provide cooked meals, arranged through tour guides. The families who do so are required to have a special room set aside for the tourists and must fit a code by the tourist companies that help them. Guests typically take food staples (cooking oil, rice, etc., but no sugar products, as they have no dental facilities) as a gift or school supplies for the children on the island. They hold nightly traditional dance shows for the tourists where they offer to dress them up in their traditional clothes and participate. Taquile is a hilly island located 45 km (28 mi) east of Puno. It is narrow and long and was used as a prison during the Spanish Colony and into the 20th century. In 1970, it became property of the Taquile people, who have inhabited the island since then (current population around 2,200). The Taquiean Island is 5.5 by 1.6 km (3.42 by 0.99 mi) in size (maximum measurements), with an area of 5.72 km2 (2.21 sq mi). The highest point of the island is 4,050 m (13,290 ft) above sea level, and the main village is at 3,950 m (12,960 ft). Pre-Inca ruins are found on the highest part of the island, and agricultural terraces on hillsides. From the hillsides of Taquile, one has a view over the white snow tops of the Bolivian mountains. The inhabitants, known as Taquileños, are southern Quechua speakers. Culture is very much alive on Taquile, which can be seen in the traditional clothes everyone wears. Taquile is especially known for its handicraft tradition, which is regarded as among the highest quality handicrafts not only in Peru, but also in the world. "Taquile and Its Textile Art" were honored by being proclaimed "Masterpieces of the Oral and Intangible Heritage of Humanity" by UNESCO. Knitting is exclusively performed by males, starting at age eight. The women exclusively make yarn and weave. Taquileans are also known for having created an innovative, community-controlled tourism model, offering home stays, transportation, and restaurants to tourists. Ever since tourism started coming to Taquile in the 1970s, the Taquileños have slowly lost control over the mass day-tourism operated by non-Taquileans. They have thus developed alternative tourism models, including lodging for groups, cultural activities, and local guides, who have recently completed a 2-year training program. Furthermore, the local Travel Agency Munay Taquile has been established to regain control over tourism. The people in Taquile run their society based on community collectivism and on the Inca moral code ama sua, ama llulla, ama qhilla, (do not steal, do not lie, do not be lazy). The island is divided into six sectors or suyus for crop rotation purposes. The economy is based on fishing, terraced farming horticulture based on potato cultivation, and tourist-generated income from the roughly 40,000 tourists who visit each year. Situated on the Bolivian side of the lake with regular boat links to the Bolivian town of Copacabana, Isla del Sol ("Island of the Sun") is one of the largest islands of the lake. Geographically, the terrain is harsh; it is a rocky, hilly island. No motor vehicles or paved roads are on the island. The main economic activity of the approximately 800 families on the island is farming, with fishing and tourism augmenting the subsistence economy. Oover 180 ruins remain on the island. Most of these date to the Inca period around the 15th century AD. Many hills on the island contain terraces, which adapt steep and rocky terrain to agriculture. Among the ruins on the island are the Sacred Rock, a labyrinth-like building called Chicana, Kasa Pata, and Pilco Kaima. In the religion of the Incas, the sun god was believed to have been born here. During 1987–92, Johan Reinhard directed underwater archaeological investigations off of the Island of the Sun, recovering Inca and Tiahuanaco offerings. These artifacts are currently on display in the site museum of the village of Challapampa. Isla de la Luna is situated east from the bigger Isla del Sol. Both islands belong to the La Paz Department of Bolivia. According to legends that refer to Inca mythology Isla de la Luna (Spanish for "island of the moon") is where Viracocha commanded the rising of the moon. Ruins of a supposed Inca nunnery (Mamakuna) occupy the oriental shore. Archaeological excavations indicate that the Tiwanaku peoples (around 650–1000 AD) built a major temple on the Island of the Moon. Pottery vessels of local dignitaries dating from this period have been excavated on islands in Lake Titicaca. Two of them were found in the 19th century and are now in the British Museum in London. The structures seen on the island today were built by the Inca (circa 1450–1532) directly over the earlier Tiwanaku ones. Amantani Island – Peru: In the background is the Capachica Peninsula. Suriki is thought to be the last place where the art of reed boat construction survives, at least as late as 1998. Craftsmen from Suriqui helped Thor Heyerdahl in the construction of several of his projects, such as the reed boats Ra II and Tigris, and a balloon gondola. The dual gauge car float Manco Capac links PeruRail's 1,435 mm (4 ft 8 1⁄2 in) standard gauge line at Puno with the Bolivian railways' 1,000 mm (3 ft 3 3⁄8 in) meter gauge line at Guaqui. The lake has had a number of steamships, each of which was built in the United Kingdom in "knock down" form with bolts and nuts, disassembled into many hundreds of pieces, transported to the lake, and then riveted together and launched. In 1862 Thames Ironworks on the River Thames built the iron-hulled sister ships SS Yavari and SS Yapura under contract to the James Watt Foundry of Birmingham. The ships were designed as combined cargo, passenger, and gunboats for the Peruvian Navy. After several years' delay in delivery from the Pacific coast to the lake, Yavari was launched in 1870 and Yapura in 1873. Yavari was 30 m (100 ft) long, but in 1914 her hull was lengthened for extra cargo capacity and she was re-engined as a motor vessel. During the last days of the War of the Pacific, Chile was sending a warship on railroad to Titicaca Lake to disrupt trade. In 1892, William Denny and Brothers at Dumbarton on the River Clyde in Scotland built SS Coya. She was 52 m (170 ft) long and was launched on the lake in 1893. In 1905, Earle's Shipbuilding at Kingston upon Hull on the Humber built SS Inca. By then, a railway served the lake, so the ship was delivered in kit form by rail. At 67 m (220 ft) long and 1,809 tons (1,994 U.S. tons), Inca was the lake's largest ship thus far. In the 1920s, Earle's supplied a new bottom for the ship, which also was delivered in kit form. Trade continued to grow, so in 1930, Earle's built SS Ollanta. Her parts were landed at the Pacific Ocean port of Mollendo and brought by rail to the lake port of Puno. At 79 m (260 ft) long and 2,200 tons (425 U.S. tons), she was considerably larger than the Inca, so first a new slipway had to be built to build her. She was launched in November 1931. In 1975, Yavari and Yapura were returned to the Peruvian Navy, which converted Yapura into a hospital ship and renamed her BAP Puno. The Navy discarded Yavari, but in 1987, charitable interests bought her and started restoring her. She is now moored at Puno Bay and provides static tourist accommodation while her restoration continues. Coya was beached in 1984, but restored as a floating restaurant in 2001. Inca survived until 1994, when she was broken up. Ollanta is no longer in scheduled service, but PeruRail has been leasing her for tourist charter operations. ^ a b c d e f g h i j k "Data Summary: Lago Titicaca (Lake Titicaca)". International Lake Environment Committee Foundation – ILEC. Archived from the original on 2011-07-23. Retrieved 2009-01-03. ^ "Lago Titicaca". Ramsar Sites Information Service. Retrieved 25 April 2018. ^ a b c Grove, M. J., P. A. Baker, S. L. Cross, C. A. Rigsby and G. O. Seltzer 2003 Application of Strontium Isotopes to Understanding the Hydrology and Paleohydrology of the Altiplano, Bolivia-Peru. Palaeogeography, Palaeoclimatology, Palaeoecology 194:281-297. ^ Questions Unlimited (2003). "Who Wants to Be a Judge at the National Academic Championship?". National Academic Championship. Retrieved 6 December 2016. ^ "The World Factbook". cia.gov. Retrieved 27 April 2015. ^ "Highest Lake Elevations in the World". About.com Education. Retrieved 27 April 2015. ^ "The Highest Lake in the World". highestlake.com. Retrieved 27 April 2015. ^ a b c Dejoux, C. and A. Iltis (editors) (1992). Lake Titicaca: A Synthesis of Limnological Knowledge. 68. Kluwer Academic Publishers, Boston. ^ Roche, M. A., J. Bourges, J. Cortes and R. Mattos (1992). Climatology and Hydrology of the Lake Titicaca Basin. In Lake Titicaca: A Synthesis of Limnological Knowledge, edited by C. Dejoux and A. Iltis, pp. 63–88. Monographiae Biologicae. vol. 68, H. J. Dumont and M. J. A. Werger, general editor. Kluwer Academic Publishers, Boston. ^ Cross, S. L., P. A. Baker, G. O. Seltzer, S. C. Fritz and R. B. Dunbar (2001). Late Quaternary Climate and Hydrology of Tropical South America Inferred from an Isotopic and Chemical Model of Lake Titicaca, Bolivia and Peru. Quaternary Research 56(1):1–9. ^ Mourguiart, P., T. Corrége, D. Wirrmann, J. Argollo, M. E. Montenegro, M. Pourchet and P. Carbonel (1998). Holocene Palaeohydrology of Lake Titicaca Estimated from an Ostracod-Based Transfer Function. Palaeogeography, Palaeoclimatology, Palaeoecology 143:51–72. ^ Baucom, P. C. and C. A. Rigsby 1999 Climate and Lake Level History of the Northern Altiplano, Bolivia, as Recorded in Holocene Sediments of the Rio Desaguadero. Journal of Sedimentary Research 69(3):597–611. ^ Talbi, A., A. Coudrain, P. Ribstein and B. Pouyaud (1999). Computation of the Rainfall of Lake Titicaca Catchment During the Holocene. Géosciences de Surface 329:197–203. ^ Shahriari, Sara (30 March 2012). "Pollution threatens South America's Lake Titicaca". The Christian Science Monitor. Retrieved 26 May 2012. ^ Weis, Almut. "GNF – Lake Titicaca". www.globalnature.org. ^ "Threatened Lake of the Year 2012". GNF. 22 March 2012. ^ La Barre, W. (1948) The Aymara Indians of the Lake Titicaca Plateau, Bolivia. American Anthropological Association Memoir. no. 68, pp. 208–210. ^ a b Kroll; Hershler; Albrecht; Terrazas; Apaza; Fuentealba; Wolff; and Wilke (2012). The endemic gastropod fauna of Lake Titicaca: correlation between molecular evolution and hydrographic history. Ecol Evol. Jul 2012; 2(7): 1517–1530. ^ Parenti, Lynne R. (1984). A taxonomic revision of the Andean Killifish Genus Orestias (Cyprinodontiformes, Cyprinodontidae). Bulletin of the American Museum of Natural History 178: 107–214. ^ Vila, Morales, Scott, Poulin, Veliz, Harrod and Mendez (2013). Phylogenetic and phylogeographic analysis of the genus Orestias (Teleostei: Cyprinodontidae) in the southern Chilean Altiplano: the relevance of ancient and recent divergence processes in speciation. Journal of Fish Biology 82, 927–943. ^ Slugina, Z.V. (2006). Endemic Bivalvia in ancient lakes. Hydrobiologia 568(S): 213–217. ^ González, E.R. ; and Watling, L. (2003). Two new species of Hyalella from Lake Titicaca, and redescriptions of four others in the genus (Crustacea: Amphipoda). Hydrobiologia 497(1-3): 181–204. ^ Pull-apart basins, also called strike-slip basins, are regional topographic depressions created by lateral movement at a bend or discontinuity within a strike slip fault. ^ Marocco, R., R. Baudino, and A. Lavenu, 1995, Intermontane Late Paleogene–Neogene Basins of the Andes of Ecuador and Peru: Sedimentologic and Tectonic Characteristics. in A.J. Tankard, R. Suárez Soruco, and H.J. Welsink, eds., pp. 597–613, Petroleum basins of South America: Memoir no. 62. American Association of Petroleum Geologists, Tulsa, Oklahoma. ^ a b c Fritz, S. C., P. A. Baker, G. O. Seltzer, A. Ballantyne, P. Tapia, H. Cheng, and R. L. Edwards, 2007, Quaternary glaciation and hydrologic variation in the South American tropics as reconstructed from the Lake Titicaca drilling project. Quaternary Research 68(3):410–420. ^ Fritz, S.C., P.A. Baker, P. Tapia, T. Spanbauer, and K. Westover (2012) Evolution of the Lake Titicaca basin and its diatom flora over the last ~370,000 years. Palaeogeography, Palaeoclimatology, Palaeoecology 317–318:93–103. ^ Clapperton, C. M., 1993, Quaternary Geology and Geomorphology of South America. Elsevier Science, Amsterdam, 779 pp. ^ Rouchy, J. M., M. Servant, M. Fournier, and C. Causse, 1996, Extensive carbonate algal bioherms in Upper Pleistocene saline lakes of the central Altiplano of Bolivia: Sedimentology 43(6):973–993. ^ Placzek, C., J. Quade, and P. J. Patchett, 2006, Geochronology and stratigraphy of Late Pleistocene lake cycles on the Southern Bolivian Altiplano: implications for causes of tropical climate change. Geological Society of America Bulletin 118(5-6):515–532. ^ "ClClimatological Information for Juliaca, Peru". Hong Kong Observatory. ^ a b c d e f g Foer, Joshua (February 25, 2011). "The Island People: The seventh hidden wonder of South America". Slate. Archived from the original on October 7, 2016. ^ a b c Istvan, Zoltan (July 3, 2003). "Rough Waters for Peru's Floating Islands". National Geographic Channel. Archived from the original on August 6, 2016. ^ Reinhard, Johan (1992) "Underwater Archaeological Research in Lake Titicaca, Bolivia." In Ancient America: Contributions to New World Archaeology, N. Saunders (ed. ), Oxford: Oxbow Books, pp. 117–143. ^ "Collection search: You searched for Tiahuanaco Titicaca earthenware". British Museum. ^ a b Box, Ben (1998). South American Handbook. Footprint Handbooks. p. 292. ISBN 978-0-8442-4886-8. ^ a b c d e f g "The Yavari Story". Yavari - Lake Titicaca - Peru. The Yavari Project. Retrieved 2011-05-20. ^ Sater, William F. (2007). Andean Tragedy: Fighting the War of the Pacific, 1879–1884. Lincoln and London: University of Nebraska Press. ISBN 978-0-8032-4334-7. ^ a b Cameron, Stuart; Robinson, George; Strathdee, Paul. "SS Coya". Clyde-built Database. Retrieved 2011-05-20. ^ a b c d "The Lake Steamers – Post 1900". Yavari – Lake Titicaca – Peru. The Yavari Project. Archived from the original on 2011-09-28. Retrieved 2011-05-21. ^ a b c d e f g h Grace, Michael L (2009-11-16). "The SS Ollanta". Cruising the Past. Retrieved 2011-05-20. ^ Dickinson, Rob. "Steam in Peru 2001". International Steam Pages. Retrieved 2011-05-20. 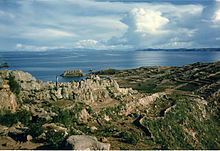 Wikimedia Commons has media related to Lake Titicaca. Wikivoyage has a travel guide for Lake Titicaca.